It appears less likely that Enbridge will meet a federal deadline to dredge some of the oil that remains at the bottom of the Kalamazoo River. The oil is left over from the company’s spill three years ago. The Environmental Protection Agency wants the work done by the end of this year. They say the work will remove 12,000 – 18,000 gallons of “recoverable oil”. Enbridge needs to get several permits from Michigan’s Department of Environmental Quality to do the dredging work in five locations. Three years ago today, an underground pipeline carrying tar sands oil to refineries near Detroit ruptured near Marshall, Michigan. The break went undetected overnight, allowing hundreds of thousands of gallons of thick oil to seep into the Kalamazoo River. On July 26, 2010, a call came into Jay Wesley’s office in Plainwell that there’d been an oil spill. “We expected to see an overturned truck or something like that. That’s typically what our spills are like here, very minor,” he says. This week marks three years since an Enbridge Energy pipeline ruptured near Marshall, Michigan. More than a million gallons of tar sands oil have been cleaned up from Talmadge Creek and the Kalamazoo River, but the cleanup isn't over yet. We got an update on the cleanup efforts and what still needs to be done. And, we heard from Michigan storyteller Allison Downey. She brought us the voices of the workers at a recent summer carnival. 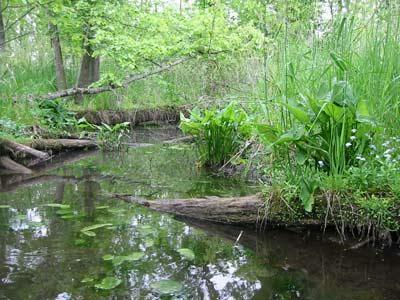 And, a new study at Michigan State University is investigating how dioxins affect human health. The lead researcher for this study joined us today. Also, bankruptcy isn't the only issue Detroit is facing. 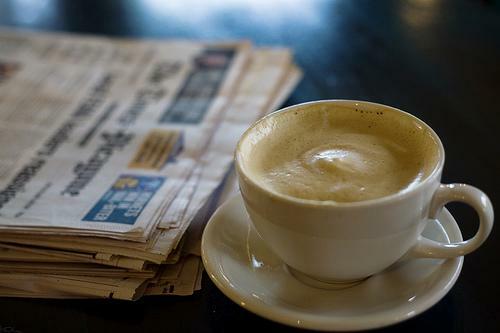 We took a look at how crime is plaguing the city. First on the show, eventually Detroit’s bankruptcy filing will be over. Eventually, Emergency Manager Kevyn Orr will no longer be in charge of Detroit’s finances. When those things happen, Detroit will go back to being run by its city government… by a mayor, and a city council. Daniel Howes, columnist at The Detroit News, focused on this future in his column yesterday in the News. He joined us today to discuss whether Detroit can shed its bad governance habits in light of the bankruptcy. An interview with Michigan Radio's Lindsey Smith. This week marks three years since an Enbridge Energy pipeline ruptured near Marshall, Michigan. 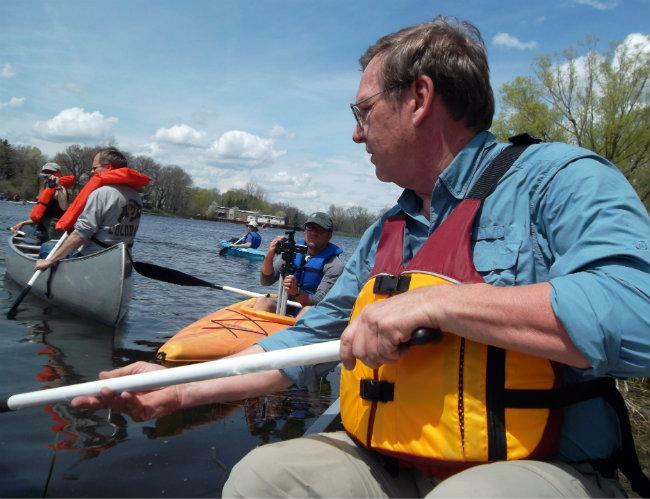 More than one million gallons of tar sands oil have been cleaned up from Talmadge Creek and the Kalamazoo River. 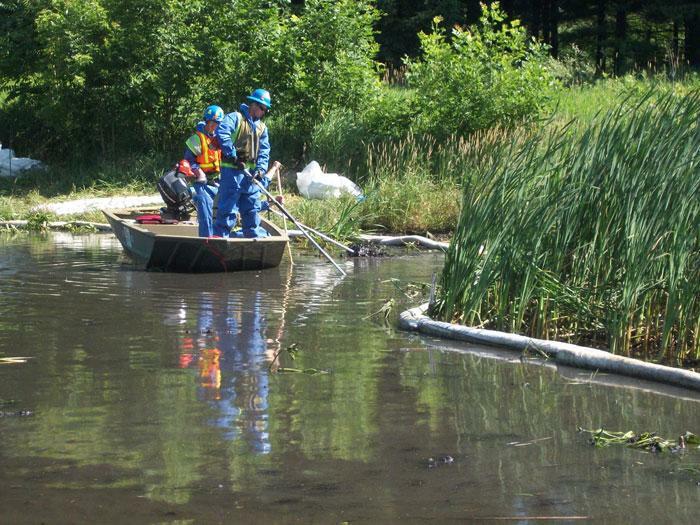 The cleanup has already cost Enbridge almost a billion dollars and they still have lots of work ahead of them. Michigan Radio's Lindsey Smith has been following the story, and she joined us today from Muskegon. The state is moving ahead to dissolve the Inkster and Buena Vista school districts. Both districts failed to meet a deadline yesterday to prove they could keep their doors open next school year. Now state officials say it could be a matter of days before the districts are dissolved, Michigan Public Radio's Jake Neher reports. Enbridge energy is building a 285 mile pipeline across Michigan that will carry tar sands oil. The pipeline will replace the one that ruptured three years ago. Yesterday, protesters chained themselves to heavy equipment at a worksite southeast of Lansing. They say the new pipeline will present an environmental threat. Twelve people were arrested at a protest yesterday, Michigan Radio's Steve Carmody reports. Will Detroit retirees see pension cuts? A federal bankruptcy court will now be the scene for some huge decisions about the future of Detroit which filed for Chapter Nine protection last week. One of the key issues is whether retirees will see their benefits cut. Michigan Radio's Sarah Hulett has more. More than a hundred protesters rallied in Detroit's Grand Circus Park yesterday in response to the not guilty verdict in the George Zimmerman trial. Zimmerman was charged with second degree murder in the shooting death of black 17-year-old Trayvon Martin in Florida. Rally goers described a desire for overall social change regarding civil rights issues like education, mass incarceration and gun violence. 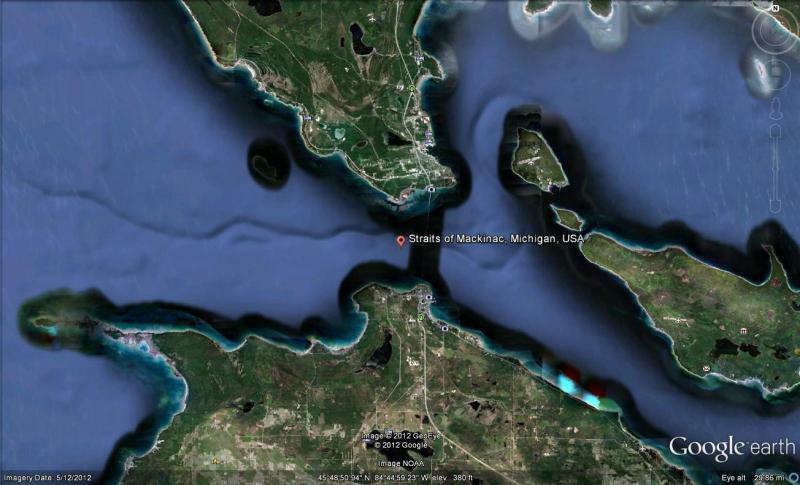 Environmental groups have rallied to call attention to an oil pipeline that crosses the Straits of Mackinac, the area linking Lakes Huron and Michigan. Critics say the 60-year-old pipeline at the bottom of the straits is aging and risky.They also fear Enbridge will pump heavy tar sands oil through the line, although the company says it has no plans to do so. It says the line is safe and regularly monitored. College students who go to pricier state schools are graduating with less student loan debt than those from supposedly less expensive state schools. On average, graduates from Michigan Tech, Central Michigan and Eastern Michigan University all have more student loan debt than those from Michigan State or the University of Michigan. Debbie Cochrane, research direction at the Institute for College Access and Success, says because of the amount of financial aid that might be available, the high sticker price of a larger school might actually end up costing less than a supposedly more affordable state school. Protesters are expected Sunday afternoon near the Mackinac Bridge. The protest won’t be about what travels over the bridge, but actually beneath it. Jim Lively is the program director at the Michigan Land Use Institute. He says several environmental groups are worried about an aging oil pipeline that passes through the Mackinac Straits. “It’s really unclear what the benefit is to the state of Michigan to take this oil that’s coming from either Canada or North Dakota,” says Lively. Enbridge Energy has until July 31st to submit a plan to resolve problems with its new oil pipeline. The line will span much of lower Michigan once completed. 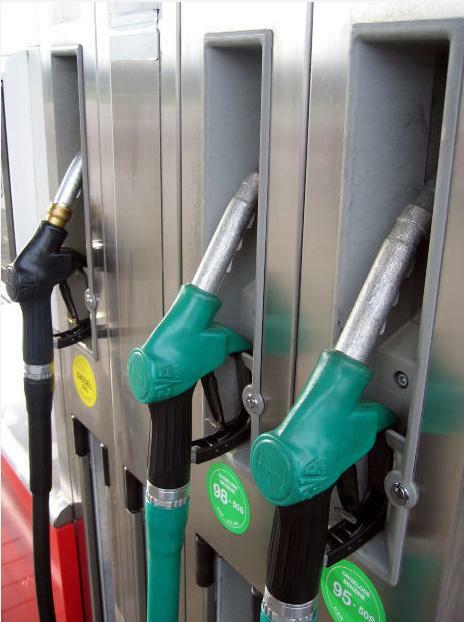 It’ll replace the one that burst in 2010, causing the oil spill in the Kalamazoo River. Michigan’s Department of Environmental Quality cited a dozen violations of the conditions of a water discharge permit. MDEQ investigated the site in Livingston County’s Tyrone Township after a video surfaced online of reddish colored hydrostatic test water spewing into North Ore Creek. MDEQ found Enbridge didn’t have someone on site overseeing the tests on the pipeline. Water sampling and testing wasn’t done as required. There was too much oil and grease discharged, among other issues. Why did that guy crawl into a pipeline in Michigan? Chris Wahmoff has left the Enbridge pipeline. He told officials he was planning to exit the pipe at 5 p.m. today. It was his birthday after all. A man identified as Chris Wahmoff crawled into a pipeline in Marshall, Michigan early this morning. Reports say he's still in there. Wahmoff is protesting Enbridge Energy Partners LLP, an Canadian-based oil company responsible for the largest freshwater oil spill in the U.S. According to the activist group Earth First! Newswire, Wahmoff is located less than half a mile from where Line 6B broke in 2010. The U.S. State Department has extended the public comment period on a proposal to nearly double the amount of crude oil that's shipped in a pipeline along Lake Superior. Enbridge Energy’s Line 67, also known as the “Alberta Clipper” pipeline, runs from the tar sands region in Canada down to Wisconsin near Lake Superior. In the US, it's more than 300 miles long and three feet in diameter. The Environmental Protection Agency says more dredging is needed to remove submerged oil in parts of the Kalamazoo River. The oil is from a massive spill in 2010. It’s been two and half years since a pipeline ruptured near Marshall, spewing hundreds of thousands of gallons of crude oil that eventually fouled about forty miles of the Kalamazoo River. The EPA says more than a million gallons of oil have been recovered since the cleanup began. But the agency says there’s still more oil submerged in the river. We’re rounding the corner on the three year anniversary of the Enbridge oil spill near Marshall. The cleanup isn’t over yet and so far, more than a million gallons of thick tar sands oil have been cleaned up from the Kalamazoo River and Talmadge Creek. State officials have been looking at possible health risks from the spill. This week, the Michigan Department of Community Health released a report on drinking water wells along the spill zone. There's good news and bad news for residents with drinking water wells near the Kalamazoo River. 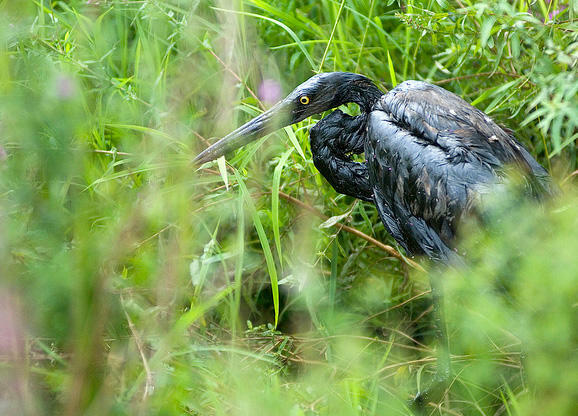 A massive oil spill contaminated the river in 2010. State officials tested 150 of the residential water wells for contaminants. “Now the oil related chemicals, those would have been iron and nickel, they were detected in a few wells but nothing but was levels of concern,” says Angela Minicuci, a spokeswoman for the Michigan Department of Community Health. The Michigan Public Service Commission today approved replacing a 16o mile section of an oil pipeline that ruptured in 2010. This is the third and final phase of the project. The company is expected to install the new pipeline later this year. It will stretch from Berrien County in the west to St. Clair County in the east. The new pipeline will replace the section of pipe that broke near Marshall nearly two and a half years ago. 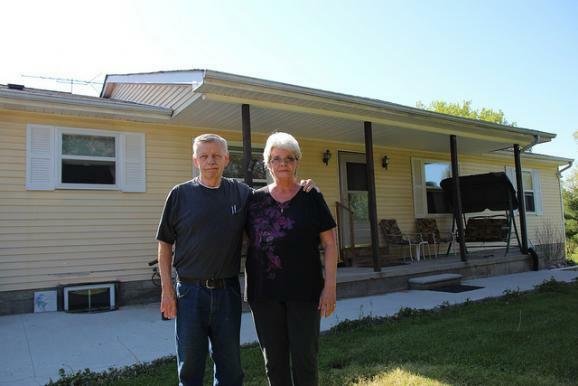 Enbridge’s pipeline replacement project has run into some opposition, mainly from people who don’t like having no say over having the pipeline built on their property. 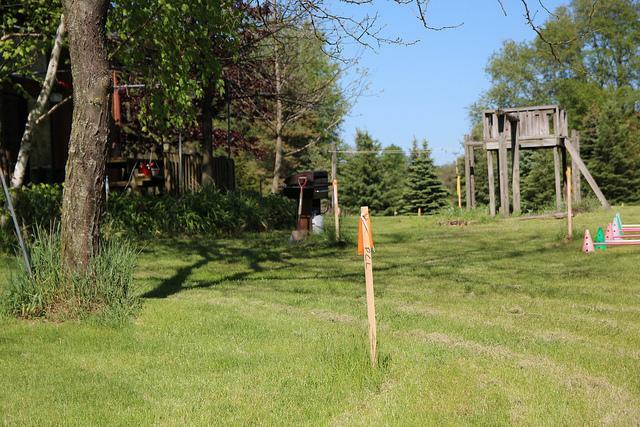 “Enbridge is working with homeowners on addressing some concerns where they can…they are making changes to accommodate people’s concerns," says Judy Palnau, a Michigan Public Service Commission spokeswoman. The Kalamazoo River continues to recover from the 2010 oil spill. Cleanup crews have removed more than a million gallons of crude oil from along more than 30 miles of the river. This replacement project will restore the ultimate capacity of the Line 6B pipeline to meet increasing demand for additional transportation capacity, which is largely driven by current and planned refinery upgrades and expansions in Michigan, Ohio and eastern Canada. In addition, the replacement project will reduce the amount of future maintenance activities that would otherwise be required to maintain the integrity of the pipeline. Construction is expected to begin in the spring. The commission’s order, which was issued today, is the last of three approvals the company had sought, and includes sections in Oakland, Macomb, Berrien, Cass, St. Joseph, Kalamazoo, Calhoun, Jackson, Ingham and St. Clair counties. The order allows the company to complete 110 miles of 36-inch diameter pipeline and 50 miles of 30-inch diameter pipeline. You can listen to today's Environment Report segment above. Enbridge Energy has a bit of a bad reputation in Michigan. In 2010, one of the company’s pipelines burst near Marshall. 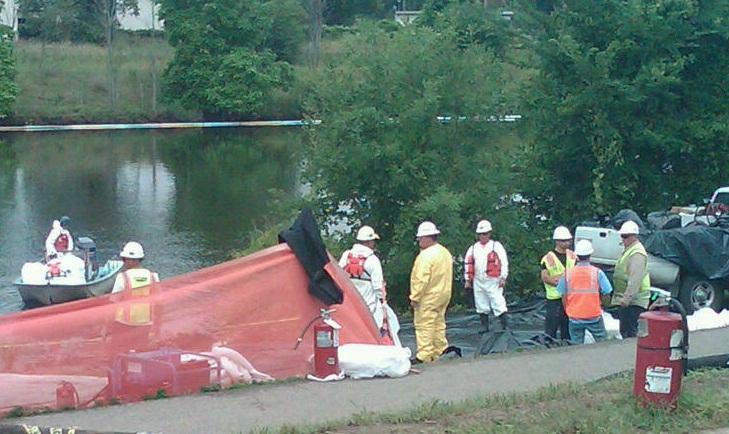 More than a million gallons of oil have been cleaned up so far from the Kalamazoo River. Last winter there was a small leak near Sterling in the northeast part of the state. But Enbridge is planning for growth. They’re replacing the pipeline that burst - Line 6B - and they’re building some new sections as well. The company hopes to double the amount of oil they can move from Canada to refineries in Michigan and Ohio (we've previously reported that an Enbridge spokesman said the main product in the new pipeline will be from Alberta's tar sands region. The EPA says the nature of tar sands oil made the Kalamazoo River spill much more difficult to clean up). 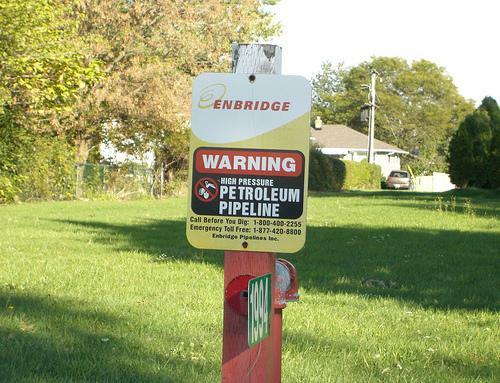 Enbridge has been running a public relations campaign to try to improve its image. But some landowners along the pipeline route are not impressed. "The American Civil Liberties Union filed a legal challenge to a state rule banning election campaign signs at bars and restaurants Thursday. 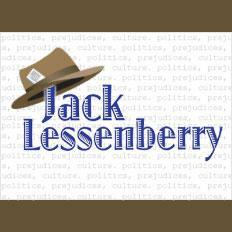 The Michigan Liquor Control Commission rule forbids businesses with liquor licenses from displaying signs endorsing a political candidate or party," Jake Neher reports. "Michigan’s first bus rapid transit system will be built in the Grand Rapids area. Federal transportation officials signed the agreement Thursday. Bus rapid transit operates similar to light rail, but at a fraction of the cost. Buses will arrive at stops every ten minutes. They’ll have designated lanes and be able to shift traffic lights so they don’t have to slow down," Lindsey Smith reports. "A planned expansion of an oil pipeline that passes through the Mackinac Straits is coming under fire. The National Wildlife Federation released a report opposing Enbridge Energy’s plans to increase the amount of oil passing through the straits. Beth Wallace is with the Federation. She fears the nearly 60 year old pipeline could rupture like another Enbridge pipeline near Marshall did in 2010. An Enbridge spokesman says the Calgary-based oil company is reviewing the Federation report," Steve Carmody reports. A national environmental group says plans to expand an oil pipeline near Mackinac Island presents a serious ecological threat. The National Wildlife Federation opposes Enbridge Energy’s plans to expand the nearly 60 year old pipeline that passes through the Straits of Mackinac. Beth Wallace, with the National Wildlife Federation, said the age of the pipeline, the Straits of Mackinac's dangerous currents, and a lack of safety equipment close by threatens to put the vacation destination at risk of a major spill. "With Enbridge’s estimates and average current speeds for the Straits, we believe oil could spread to Mackinaw City and Mackinac Island in the three hours it would take them to respond," said Wallace. "If six hours passed, oil could spread to Wilderness State Park. Twelve hours, and oil could be all the way to Cheboygan [Michigan],” said Wallace, “and the damage from a spill, without a doubt, would be devastating." It took Enbridge 17 hours to realize it had a broken pipeline near Marshall, Michigan in 2010. That spill released more than 800,000 gallons of crude oil. The cleanup of Talmadge Creek and the Kalamazoo River has cost close to a billion dollars. There is still oil in the river. An Enbridge spokesman says the Calgary-based oil company is reviewing the National Wildlife Federation's report. Pipeline safety is a top priority at PHMSA, and we hold pipeline operators accountable when they violate federal requirements. For example, Enbridge just paid thehighest civil penalty in the agency’s history for the Marshall, Michigan spill. 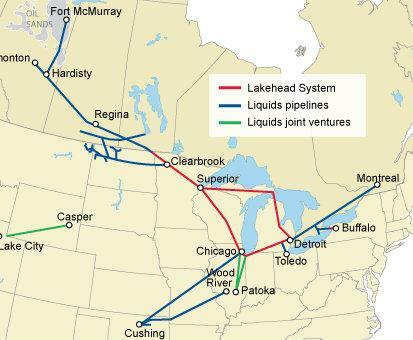 In addition, PHMSA executed a consent agreement which imposed morestringent safety requirements for the entire Lakehead System, including Line 5. Pipeline safety requires a combination of enforcement, information sharing and transparency and public education. PHMSA created the Stakeholder Communications website to provide the public comprehensive, searchable information on the safety records of pipeline companies, such as incident rates and PHMSA’s oversight actions and enforcement activities including fines, warnings, and violations. Additional information on pipeline operators in Michigan can be found on our Michigan State Pipeline Safety Profilepage. "The group that led the charge to repeal Michigan’s motorcycle helmet requirement says the state has not suffered a rash of biker deaths in the past six months. That’s how long it’s been since the law was changed. American Bikers Aiming Toward Education points to state data between January and the end of August. But state officials say that’s not the whole story. They say early data also show a 14-percent jump in disabling injuries. The state Office of Highway Safety Planning says the data are preliminary and it’s too early to reach real conclusions on the effects of the changes in the law," Jake Neher reports. "Tigers slugger Miguel Cabrera became the first player in 45 years to win baseball's Triple Crown last night, joining an elite list that includes Mickey Mantle, Ted Williams and Lou Gehrig. He's the 10th Triple Crown winner in baseball history. In Major League Baseball, a player earns the Triple Crown when he leads a league in three categories--- batting average, home runs, and runs batted in," the AP reports. 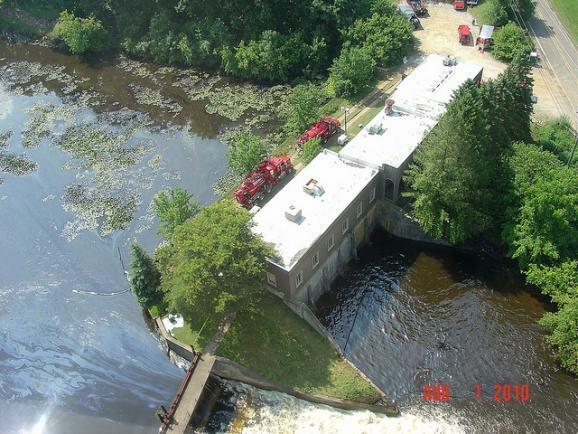 "Enbridge Energy has more clean-up work to do along the Kalamazoo River. The federal Environmental Protection Agency has ordered the oil company to tackle some new areas of pollution in the river. 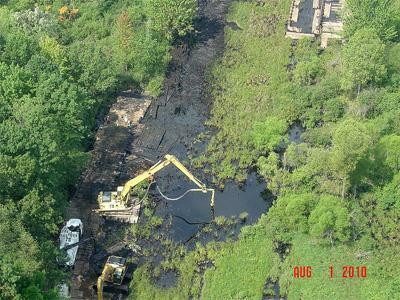 Enbridge has already done a lot of clean up work after one of their pipelines ruptured and spilled massive amounts of oil into the Kalamazoo River near Marshall in July, 2010. But the EPA says oil is coming to the surface is some new areas," Tracy Samilton reports. 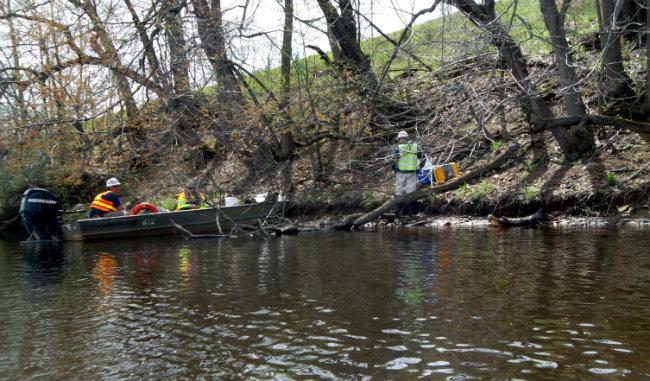 The U.S. Environmental Protection Agency told Canadian energy company Enbridge today that more work is needed to clean up the Kalamazoo River. The cleanup is part of an ongoing effort to remove oil from the river after a pipeline ruptured in 2010, resulting in the largest inland, freshwater oil spill in U.S. history. Federal regulators specified that further action is needed upstream of Ceresco Dam, upstream of the Battle Creek Dam, and in the delta upstream of Morrow Lake. You can listen to the Environment Report story here or read an expanded version below. Enbridge Energy is replacing one of its pipelines that runs through lower Michigan. They’re replacing Line 6B. It’s the same pipeline that broke in Marshall two years ago. The new pipeline will allow Enbridge to double the amount of oil they can transport to refineries in Detroit, Toledo and Sarnia, Ontario. To build the pipeline, the company says it needs additional easement next to the current 60 foot easement that runs through many people’s backyards. Enbridge says many people who own land along the pipeline route have signed contracts with the company. But Enbridge is taking people who refuse to sign contracts to court. Connie Watson and her husband Tom are among the defendants. "Enbridge has taken us to condemnation. Eminent domain is another word for it. And because we wouldn’t sign their contract as it was, they brought us to court to take the land." The Watsons say they’re frustrated with Enbridge because of experiences they’ve had with the company in the past. 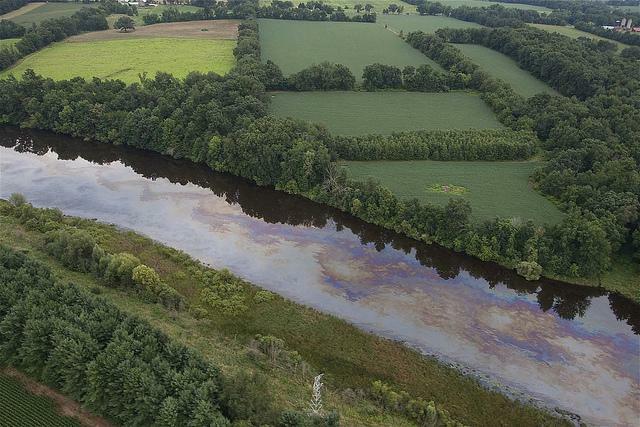 The U.S. Department of Transportation has closed its pollution case against the owner of a pipeline that ruptured in 2010, spewing oil into the Kalamazoo River. Federal regulators say Enbridge paid a $3.7 million fine to the U.S. Department of Transportation Pipeline and Hazardous Materials Safety Administration (PHMSA) last month. The company is responsible for the largest inland, freshwater oil spill in U.S. history. 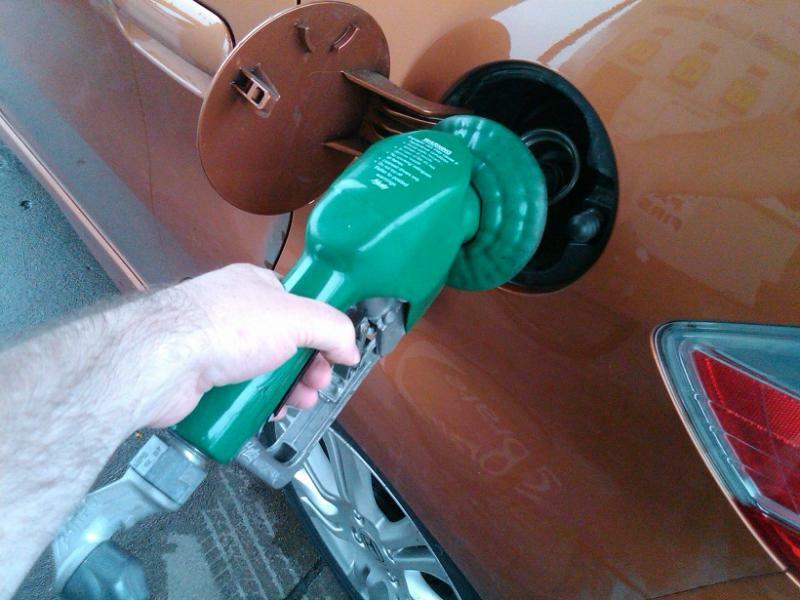 "The campaigns for and against Proposal 3 on the November ballot are debating the cost of renewable fuels versus coal and gas. Proposal 3 would require 25 percent of the state’s electricity be generated using wind, the sun, or bio-fuels by 2025. Ken Sikkema compared the costs of renewable generation to the costs of using coal or natural gas. He found renewable energy will be more expensive. The campaign FOR Proposal 3 says the ballot question would help stabilize energy costs, because the cost of wind and solar energy is not as volatile as fossil fuels," Rick Pluta reports. A hearing will take place this week to set standards for public defenders in Michigan who work with low-income people. "Michigan's public defender system is consistently rated one of the worst in the country. Michigan has no statewide training requirements for public defenders, and many public defenders say they have to take on too many cases to make a living. But they could be created soon. Lawmakers will take the first step this week. They'll hold a hearing Thursday on a bill that would create a new commission to set those standards," Sarah Hulett reports.